Most big cities have them. An enclave where the radicals and leftists live, socialise and plan the subversion of their unsuspecting neighbours. Decades ago these often bordered industrial areas, now they tend to surround universities. Barack Obama's Chicago neighbourhood, Hyde Park is such an enclave. The ultra liberal Democratic Party stronghold is the home to Nation of Islam leader Louis Farrakhan, former Weather Underground terrorists Bill Ayers and Bernardine Dohrn, Obama confidante Valerie Jarrett and lots and lots of socialists. One such socialist is Jackie Grimshaw, Barack Obama's next door neighbour-on the not Tony Rezko side. Obama's neighbor on the less famous side of his house is Jacky Grimshaw who ran Harold Washington's successful campaign for Mayor. Her husband Bill is a U. of Chicago prof. The Grimshaws sometimes baby sit the Obama girls. Jacky and Michelle Obama are very close. Jackie Grimshaw served as a senior advisor director of intergovernmental affairs under Harold Washington. Bill Grimshaw, the author of Bitter Fruit: Black Politics and the Chicago Machine, 1931-1991 was also a political adviser to Washington. The connection to Harold Washington is significant. With backing from the Communist Party and Democratic Socialists of America (DSA), Washington won the Chicago mayoralty in 1983. His victory inspired the young Obama's original move to Chicago. JACKY GRIMSHAW, Barack Obama Next-Door Neighbor: One of the things that Harold started was going out to the community with the budget, listening to what people wanted in their communities, and then responding. I think, you know, Barack coming in fresh out of school, seeing this kind of leadership, I think, helped to shape him in terms of people being empowered. 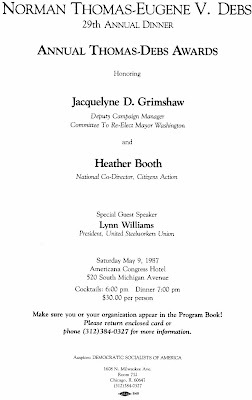 Like her late boss Harold Washington and her neighbour Barack Obama, Jackie Grimshaw also has close ties to DSA. Every year Chicago DSA hosts an awards dinner named in honour of US socialist icons Eugene Debs and Norman Thomas. Jackie Grimshaw and her colleague Heather Booth won the Debs-Thomas Award in 1987. You have been a stalwart in the Chicago independent political movement for years, and firm in your belief that building coalitions will make changes and reform possible. In both the 1983 and 1987 campaigns to elect and re-elect Mayor Harold Washington, you made your contribution by providing inspiring leadership in the victorious coalition. For all this, the Norman Thomas - Eugene V. Debs Award is presented to you on this 9th day of May, 1987. Booth for her radical educational activities. Through the Midwest Academy, you have inspired and trained thousands of new activists in the Citizen Action movement, the peace movement, and the women's movement. After DSA leader Michael Darrington died in 1989 his name was added to the socialist honour roll. The 1991 Eugene V. Debs - Norman Thomas - Michael Harrington Dinner was held at the Congress Hotel Chicago on Saturday, May 11, 1991. MC was Jackie Grimshaw. The Chicago DSA's New Ground Archive Spring 1992 issue includes an article entitled "Heather Booth, Jackie Grimshaw and Michael Dyson Wow Crowd at the University of Chicago." Michael Dyson is a leading DSA member and strong supporter of both Barack Obama and the Rev Jeremiah Wright. Some 200 people attended a panel presentation on "The Progressive Potential of Chicago City Politics" this last December 8th at the University of Chicago. The panelists included Jacquelyn Grimshaw, Alderman Toni Preckwinkle, Alderman Helen Shiller, Bernard Craighead, among others. The event was sponsored by the University of Chicago DSA Youth Section and the Hispanic Association for Cultural Expression and Recognition. Jackie Grimshaw's links to Heather Booth are important. The pair have served together on the board of the Chicago based Midwest Academy. Booth as chairman, Grimshaw as secretary/treasurer. Probably the most well-known organizing method is Alinskyism, named after Saul Alinsky, a Chicago-born community organizer who helped set up the Back of the Yards Neighborhood Council and later the Industrial Areas Foundation in the 1930s...The Mid-West Academy is a training center set up by members of DSA that draws heavily from Alinskyism. Other Midwest board members included. Paul Booth-A founder and former secretary/treasurer of the radical Students for a Democratic Society. With his wife Heather, in the 1970s, Paul Booth was a regular sponsor of the annual Debs-Thomas Dinner. Booth is a former President of Chicago’s Citizen Action Program, formed in 1969 by trainees from Saul Alinsky’s Industrial Areas Foundation. He is now an assistant to alleged DSA member Gerald McEntee, president of the public employees union AFSCME-which has endorsed Obama. Robert Creamer-Husband of the "DSA friendly" Chicago congresswoman Jan Schakowsky-a very loyal Obama supporter. Jackie Kendall-also a Debs-Thomas award winner. Kendall knew Obama when he first worked in Chicago. Heather Booth worked alongside Barack Obama when she directed field operations for Carol Moseley Braun's successful DSA/Communist Party backed Senate campaign in 1992. Barack Obama of course is also an Alisnsky disciple and has ties to Midwest through the closely allied radical organisation ACORN. Obama's ties to Jackie Grimshaw are more than neighbourly. In May Grimshaw was named to represent Barack Obama on the Credentials Committee for the Illinois Democratic Delegation to the Democratic National Convention in Denver. Over A Two-Year Period In The U.S. Senate, Obama Requested $3.2 Million In Earmarks For The Center For Neighborhood Technology. Former Employees From The Center For Neighborhood Technology "[Ben] Helphand and [Paul] Smith Have "Done Multiple Tours Of Duty In The Political Trenches-For Obama..." Executives And Board Members Of The Center For Neighborhood Technology Have Contributed $20,688 To Obama's Campaigns. Cosy little world that Hyde Park socialist set. Dude, Hyde Park is also the home to much of he faculty of the U of Chicago law school, one of the most conservative in the nation. It is an urban neighborhood, one finds all sorts of people living cheek by jowl. anonymous, you can't take this sort of tripe seriously. this whole article is basically a jumble of the weakest and most tenuous of associations being used to claim that obama is some sort of radical socialist. the board of the center for neighborhood technology gave money to the obama campaign? omg!!! so too did millions of other people! they're all part of a vast communist conspiracy! thanks, "new zeal," this is absolutely hilarious. you should consider writing for The Onion. I just stumbled across this excellent post today (August 4, 2009). I live in Chicago and cover local politics. Your post is absolutely dead-on accurate. Thanks for compiling this so concisely and in such a well-written presentation.